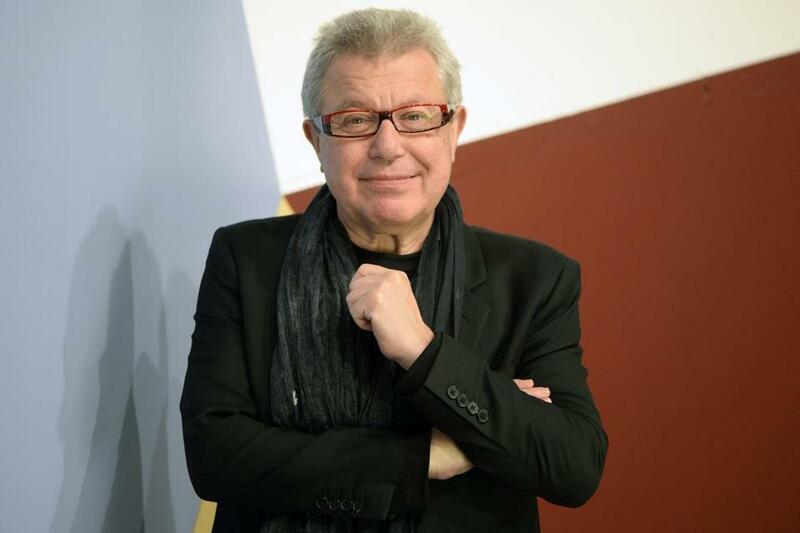 The architect Daniel Libeskind didn’t complete his first building until 1998 when he was 52. Since then he’s finished about 30 projects, including the Jewish Museum in Berlin, the Denver Art Museum extension, the Military History Museum in Dresden, Germany, and the master plan for Ground Zero in New York City. The architect was in town this past week to speak at the Museum of Fine Arts Boston. LIBESKIND: I read a lot of books simultaneously. Here are just some of the books on my nightstand. I have one from the multi-volume collection of works by and on Edgar Allen Poe. Then I have “Spiritual Body and Celestial Earth” by Henry Corbin, which is an incredible analysis of Shiite religion and mythology. I have Jorge Luis Borges’s collected stories and Herman Melville’s journals. I have “The Shadow of Ideas” by the 16th-century friar and philosopher Giordano Bruno and W.G. Sebald’s “On the Natural History of Destruction.” I also have the second volume of Marco Polo’s travels, a Lydia Davis short-story collection, and Walter Benjamin’s “Moscow Diary.” Those are just for the week. I have another series of books for the weekend. BOOKS: When you are working on building projects do you turn to reading for inspiration? LIBESKIND: Not really but I’ve memorized a lot of poetry, particularly poetry by Emily Dickinson, and when I’m working on a project a line will come up in my mind. The line might seem irrelevant, but it can lend a kind of an insight. BOOKS: When did you start memorizing Dickinson’s poems? LIBESKIND: Maybe seven or eight years ago. Someone gave me a small book of her poems that fit easily into my pocket. I realized that while I was waiting for something I could memorize those poems instead of wasting my time. BOOKS: Do you read Polish authors? LIBESKIND: I haven’t read a lot of Polish writers but I got an edition of Bruno Schulz “The Street of Crocodiles” in Polish when I was working on my building in Warsaw. Schulz is a genius. Reading him in Polish is a whole other experience. You realize that books really can’t be translated. BOOKS: Do you read about architecture? LIBESKIND: Never unless it’s about Bernini, the 17th-century Italian sculptor and architect. BOOKS: Do you have any literary heroes or favorite characters? LIBESKIND: King Matt. That character has always stuck in my head. “King Matt the First” by Janusz Korczak is about children creating a revolutionary state. Korczak was a Polish doctor and the head of a Warsaw orphanage who died in Treblinka. BOOKS: Do you read contemporary fiction? LIBESKIND: I’ve read Philip Roth and some contemporary books, but the safest bet is old books. They are reliable because they have stuck around for a long time. I’ve got biblical texts in various translations. I have ancient Egyptian texts. This is the magic of today, that you can go in a store and for $10 buy something that is priceless, like a book on Babylonian mythology. BOOKS: Do you appreciate that more because you grew up in Soviet Poland? LIBESKIND: Yes, because when I was a child in Poland most the books were propaganda about Soviet heroes. I read them voraciously because there was nothing else. When my family emigrated I used the local library in the Bronx all the time. That was reaching paradise, to get books for free and have them at home. Winston Churchill, a hero of mine, wrote a little book on art called “Painting As a Pastime.” He wrote that he would get up in the castle his family had owned for centuries and go to the library, which had thousands of books. He’d pull one out, read one paragraph, close the book and think: Isn’t the world a wonderful place? That’s such a poignant message, that you don’t have to read all the books in the world, that you can be inspired by one paragraph that you accidentally stumble upon.